HFSF was founded in July 2010, shortly after Greece signed its first bailout programme with the eurozone and the International Monetary Fund, as 10 billion euros of the financial envelope was earmarked for the support of the domestic banking system. The policy mix and the intensity of austerity were expected to strain the economy and exert pressure on the loan portfolio of Greek banks. At the end of 2009, non-performing loans (NPLs) stood at 7.7 percent of gross loans. Over the course of the crisis, the HFSF evolved into the most important and the largest, in terms of value, investment that the Greek state has made in its history. HFSF’s key participation in the Greek banking system was triggered after the Bank of Greece (BoG) identified at the end of 2012 that losses incurred from the Private Sector Initiative and credit loss projections for 14 Greek banks resulted in total capital needs of 40.54 billion euros, of which 27.5 billion related to the four core banks: Alpha Bank, Eurobank, National Bank of Greece (NBG) and Piraeus Bank. During May and June 2013, the four core banks conducted share capital increases to cover their capital shortfalls. According to the recapitalisation legislative framework that was in effect at that time, if 10 percent of the capital needs was covered by private investors, the state aid via the HFSF would be in the form of common shares with restricted voting rights. Alpha, NBG and Piraeus fulfilled the minimum private investor participation, while Eurobank was fully recapitalised by the HFSF with full voting rights in the bank’s share capital. The HFSF’s investment in the four core banks amounted to 25 billion euros via European Financial Stability Fund (EFSF) bonds in exchange for bank shares. Of that amount, 8.46 billion was injected into NBG, 6.85 billion in Piraeus, 5.73 billion in Eurobank and 3.96 billion in Alpha. As a result, the HFSF became the dominant shareholder in the banks’ share capital. controlling 98.56 percent of Eurobank, 84.39 percent in NBG, 83.66 percent in Alpha and 81.01 percent in Piraeus. The logic of the first bank capitalisation was built on the upside potential as the banking system and the economy were expected to eventually stabilise and then recover. The HFSF issued warrants to private investors and the expectation was that this would lead to the fund’s shares being gradually taken up by private investors, leaving a small gain for the recapitalisation body. The necessary condition for this strategy to succeed was that bank prices remained above the issue prices (plus a small margin) that existed during the recapitalisation process. By the end of 2013, Eurobank engaged in an exchange of hybrid and subordinated securities for shares, which resulted in a reduction of the HFSF’s participation in the bank to 95.23 percent. In addition, after the exercise of warrants the fund’s participation in Alpha was reduced to 81.7 percent. The HFSF also contributed 13.5 billion euros to cover the funding gap of banks under liquidation. The bulk of those funds were used in two specific banks: ATEbank (7.47 billion) and Hellenic Post Bank (3.73 billion). HFSF has recently assessed 10.95 billion of this amount as being non-recoverable but nonetheless necessary as part of the strategic decision of cleaning up the banking system and driving its consolidation. In Q2 2014, the four banks proceeded to a second round of recapitalisation after a follow-up stress test conducted by the BoG in cooperation with Blackrock. All banks opted for a share capital increase with cancellation of pre-emption rights. This meant that HFSF agreed not to participate in those capital increases. Banks raised 8.31 billion euros from private investors, split into 1.2 billion for Alpha, 2.86 billion for Eurobank, 2.5 billion for NBG and 1.75 billion for Piraeus. The amount of capital increases was 77 percent in excess of the capital needs under the base case scenario of the BoG’s stress tests. As a result, the HFSF’s participation was significantly diluted. At the end of 2014, the HFSF’s participation in Alpha was trimmed to 66.2 percent (from 81.7 percent), in Eurobank to 35.4 percent (from 95.2 percent), in NBG to 57.2 percent (from 84.4 percent) and in Piraeus to 66.9 percent (from 81 percent). In the third round or recapitalisation that took place last November, following a comprehensive assessment conducted by the European Central Bank’s Single Supervisory Mechanism (SSM), the four banks proceeded to share capital increases via a book-building process without the HFSF’s participation and Liability Management Exercises (LME) to cover the capital shortfall that emerged from the assessment. 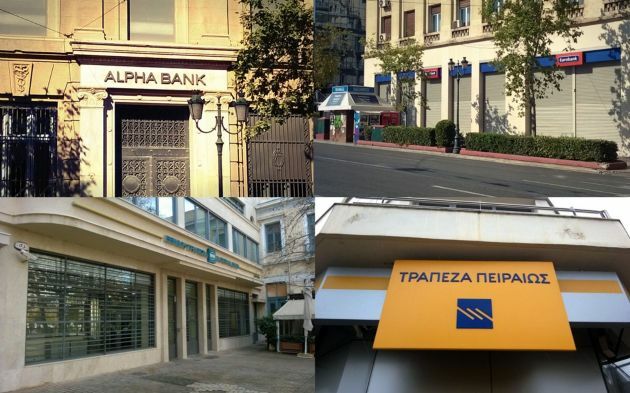 Largely via those two actions, banks enhanced their capital by 8 billion euros, with Alpha’s injection at 2.56 billion, Eurobank at 2.04 billion, NBG at 1.46 billion and Piraeus at 1.94 billion. The HFSF only participated with European Stability Mechanism (ESM) notes worth 5.43 billion, which went to NBG and Piraeus to meet the additional capital needs under the adverse stress test scenario that private investors did not cover. The HFSF contributed 2.71 billion to NBG, of which 677 million were in the form of NBG shares and 2.03 billion in the form of contingent convertible bonds (CoCos) issued by NBG. In the case of Piraeus, the HFSF contribution of 2.72 billion was split to 680 million in the form of shares and 2.04 billion in the form of CoCos. The third round of capital raising resulted in a further significant dilution of HFSF participation in the systemic banks, since its shareholding was reduced to 11 percent in Alpha, 2.4 percent in Eurobank, 40.4 percent in NBG and 26.4 percent in Piraeus. The current participation in Alpha and Eurobank is with restricted voting rights, while the bulk of its shareholding in NBG and Piraeus (38.92 and 25.95 percent respectively) is with full voting rights. Overall, HFSF has contributed a total of 30.43 billion euros for the recapitalisation of the four core Greek banks. Of this, 25 billion was injected in the first round and 5.43 billion in the third round of the recap process. The latter is split between 1.36 billion in the form of shares and 4.07 billion in CoCos and relates only to NBG and Piraeus. This is by far the largest financial commitment the Greek state has made in its history, representing close to 18 percent of the Greek economy. If you add the amounts that were required for resolutions of banks, the total allocation reaches close to 44 billion euros, or a quarter of Greece’s economy. Greece’s political elite had an incentive to protect this investment which came in the form of loans from Greece’s creditors and strive to create an environment in which it would be able to recover as much as possible and repay the loans. Over the last couple of years, though, things went in entirely the wrong direction. The banking index tumbled 46.5 percent in 2014, largely reflecting a nosedive of 33.7 percent in the last quarter of that year. The market priced in the prevailing uncertainty as Prime Minister Antonis Samaras and his government started rolling back reforms following defeats in local and European Parliament elections, failed to close the programme’s fifth review and national elections in the beginning of 2015 seemed inevitable, triggered by the failure to reach consensus in Parliament for the election of a new President of the Republic. During the first half of 2015, including the first five months of SYRIZA administration, bank shares fell further by 31.5 percent on the back of the drawn-out and confrontational negotiations with creditors, deposit flight and further deterioration of the loan portfolio. Banks shares slumped by another 91 percent by the end of the year. The share collapse in the second half of the year was marked by two key developments. The banking index plummeted by 58 percent in the first five sessions after the 5-week banking holiday - following the imposition of capital controls - in the wake of uncertainty about economic developments and rumours of massive additional capital needs. Moreover, Greek bank shares plunged by 77.2 percent in the course of November 2015, when the share capital increases were announced and conducted with deep discounts in the offer prices of the book-building processes. Those discounts ranged from 34.4 percent for Alpha to 52.4 percent for Eurobank, up to 80 percent for Piraeus andmassive 93.8 percent for NBG. Those discounts were applied on the already low prices that resulted following a 74 percent nosedive of bank stock prices in the 3-month period after the imposition of capital controls and before stress test results were announced by the SSM on October 31. Overall, the value of the Greek banking index was essentially wiped out in the course of 2015 with a plunge of 93.9 percent. This caused massive valuation losses for all bank shareholders, including the HFSF. Taking also into account the 9-month period of 2016, which sees a further decline of around 47 percent in banks’ value, the cumulative loss for the banking index since the end of 2013 stands at 99.8 percent. Nobody was hurt more from this wipe out of banks’ values than the HFSF. The market value of its bank portfolio, which stood at 22.6 billion euros at the end of 2013, almost halved to 11.6 billion at the end of 2014, while it plummeted to just 2.4 billion at the end of 2015. Following further losses in the course of 2016, the current value was dropped even lower to 1.27 billion. The sharp drop in bank prices had a negative impact also on HFSF proceeds from the exercise of warrants. Until the end of 2015, those proceeds had reached 354.52 million euros, of which 96.88 million related to warrants exercised in 2013 and 257.46 million in 2014. With warrants so deeply out of the money (less than 6 percent of strike prices), no further proceeds are expected until the end of 2017, which is their last exercise date. Of the 12 banks under resolution, the HFSF estimates the recoverable amount at 2.02 billion, having so far collected 516 million. From the initial allocation of 50 billion euros as part of Greece’s second programme, the HFSF used 25 billion for the recapitalisation of the four core banks and 13.5 billion for the resolution of non-core banks. Unused funds of 10.93 billion (in the form of EFSF bonds) were returned to the EFSF at the end of February 2015 following a Eurogroup decision. Out of a total amount of almost 44 billion used for the support of the banking system, the market value of bank shareholdings currently stands at just 1.27 billion euros. Moreover, HFSF has recovered 516 million from banks under liquidation, received around 355 million from the exercise of warrants and also holds 4.07 billion of NBG and Piraeus CoCos bearing a return of 8 percent per annum for the first seven years. Greece’s lenders do not see any proceeds from the privatisation of banks assets in the foreseeable future and the IMF goes as far as suggesting that not only will Greece not have any receipts from its bank holdings but it may need to make an additional 10-billion-euro capital injection. Never in its history has the Greek state committed so many financial resources to a single cause. Even by the political system’s notorious standards of mismanagement, never has such an investment been squandered in such a short period of time. The bill is huge but nobody seems bothered. As you said, the HFSF held 57.20% of the bank's outstanding common shares when it voted during the 19-6-15 AGM. (I assume it voted all of its shares.) As the text at the top of the 12-page vote-report states, 30.2% of the O/S shares were voted for most agenda items but the HFSF clearly DIDN'T participate in those votes. It DID vote for Agenda items 9 & 11, but only 70.15% of the O/S shares were voted for those items, NOT the 87.4% which would have resulted if the prior 30.2% affirmative vote percentage had been augmented by the fund's 57.2%. Subtracting the fund's % from the total suggests only 12.95% of the remaining shares approved Item 11. That's a BIG reduction from the prior 30.2% approval vote. Is anyone surprised that current holders voted AGAINST an "open-ended" request to issue new shares which could badly dilute then-current holdings in one more "Share Capital Increase"? WHY did the fund vote FOR this proposal which ultimately WIPED its OWN investment OUT? You may have missed that the 30.2% (mentioned in the 12-page document) excludes the shares held by HFSF (57.24%). So, the 600 shareholders held 30.2% x (100-57.24%) = 12.91% of total NBG shares and consequently the 601 shareholders controlled 12.91% + 57.24%=70.15% (of total shares) that voted for items 9 and 11. As you may see in the last page of the 12-page document, around 10% of the shares represented in the AGM voted against the share capital increase (item 11). I assume it may have been published in May of 2015. This document seems to suggest agenda item 9 was innocuous (your comment would be appreciated but I'm not requesting it). Item 11 was "the killer" because it suggested common shareholders COULD be diluted once AGAIN by the issuance of MORE new shares in ANOTHER "SCI." You then state, in your discussion of the 3rd recap, that "the bulk" of the fund's holdings of NBG's common stock (38.9%) had FULL voting rights. I noticed at the time that only 601 shareholders comprised a quorum during the bank's 6-19-15 AGM, and voted with management, to approve management's request for authorization to issue new shares or new corporate bonds. (At the time I feared this could lead to one more devastating SCI. "Little did I know" how BAD the dilution would be...) Could such a small number of holders only have comprised a quorum in 6-15 if the HFSF was one of that very small number and if it voted all of its shares? Did the fund vote with bank management to approve the "murderous" 3rd recap later in that year? I couldn't understand how the fund had seemed to move from NO voting rights to FULL rights. I wondered if the fund's large holding of the bank's shares was "skewing" shareholder votes. Can you explain? Excellent, Manos! THANKS for your responsive, substantive reply. I'm particularly impressed by the precision of your comments with respect to one of the many points of interest here: the participation of the HFSF as "THE SIX HUNDREDTH AND FIRST" voting shareholder in that "puny" quorum of only 601 shareholders. 601 shareholders comprised a voting quorum when > 3.5 BILLION shares were outstanding, many in the hands of naïve victims like me. ( Here's *fully-optional* reading: One of multiple attempts I made at the time to keep up with these bewildering developments: http://stocktwits.com/Potik/message/46715536 ) You pointed out, helpfully, that the HFSF voted all of its shares, which were then *** 57.20% *** of the common shares outstanding. Multiple documents about the 19-6-15 AGM were published by the bank at its Eng-lang "General Assemblies" page ( https://www.nbg.gr/en/the-group/investor-relations/general-assemblies# ) They're still there now, in the section captioned "Annual General Meeting of Shareholders on 19 June, 2015." The same 12-page PDF to which you linked at the Helex site is shown by the bank's own site at: ( https://www.nbg.gr/english/the-group/investor-relations/general-assemblies/Documents/EN_VOTING_RESULTS_19-06-2015.pdf ). The previously held HFSF participation of 57.2% in NBG with restricted voting rights was diluted to 1.5% after the 3rd round of recapitalization. In addition, any shares acquired by HFSF in the 3rd round, including the state preference shares that were bailed-in, were with full voting rights, since this was foreseen in the legislative framework of that recapitalisation. At the time of the AGM that you mentioned (June 19, 2015), HFSF voted with its stake of 57.2% for specific items of the agenda, eg item 9 (authorization for the BoD to increase NBG’s share capital) but not eg for item 5 (election of new BoD). In the following link, you may see that 600 shareholders controlling a stake of 30.2% (excl HFSF) voted for most items and 601 shareholders (the additional is HFSF) controlling 70.15% voted for two items that required increased quorum. Cannot agree more, except for the "purposes of keeping Greece to its knees" part. The Greek banking system is unsustainable due to the high amount of NPLs, the overall economic situation, etc.. The lever used by the EU and the ECB collectively was the freezing of ELA (forcing capital controls). ELA is often depicted by German media (cf. Hans-Werner von Sinn) as a "hidden credit" to Greece . However, ELA is the "normal" part of the ECB Target system on which weak economies have to rely nowadays. The amounts of Target and ELA since 2010 are mainly the "mirror" of capital flows which came to Greece between 2001 and 2008 and which have left Greek banks since 2010. This article is guilty of misappropriation. It claims that somehow "mismanagement" caused the value evaporation when we all know that it was Schauble who is responsible for 99.9% of this calamity. The Greek banking system is totally under Berlin's control by design and it's the only effective level to manipulate Greece. The Greek banks are borrowing at ELA rates which are much higher than other European banks and have zero access to QE. And this is all for purposes of keeping Greece to its knees otherwise a healthy banking system deprives the lenders from exercising effective control. So I hope we can all agree that the mismanagement issue is squarely into the eurozone shoulders and there is absolutely nothing that Greece could have done to alleviate such situation because the minute you remove an effective lever of control the eurozone will invent a new control mechanism until the victim cries uncle. This is why Greece needs to re-evaluate its relationship with the eurozone unless it prefers bona fide slavery. The Greek political system is under the false impression that eurozone membership brings benefits when in reality is the kiss of death for the Greek economy. No, no, no, let me tell you what it really is all about.